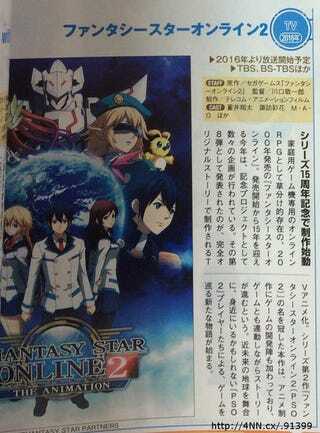 Phantasy Star Online 2 will get an Anime! In Conmemoration of the 15 years of Phantasy Star Online. The Newest issue of Tokuma Shoten´s Animage it has been anounced that an Anime adaptation of the MMO RPG Phantasy Star Online 2 will be made. Keiichiro Kawaguchi (Hayate the Combat Butler) is directing it, while Mitsutaka Hirota (Persona 4 the Animation) is writing and overseeing the Script, Minoko Takasu (FMA: Brotherhood) is designing the Characters. The series will come on 2016. Phantasy Star Online 2 is a Free to Play MMORPG for Pc, iOS and PsVITA. Its already exclusive for Japan and Sega has been silent about it´s release world wide. Also i said that i will buy a Vita when this game comes to west, and since that hasnt hapened wel..